This behemoth can be bombed a country mile, churns tons of water during steady retrieves provoking smash after smash. The Frigg 2.5 digs in deeper and will get pulled under when chugging across the flow. The Frigg 2.5 is designed to draw insanely vicious surface strikes from big predatory fish. Choose a Frigg 2.5 color that duplicates the natural colors of the local forage but will provide the lure the greatest contrast to the water which will enhance the plug’s visibility. From Snook to Stripers, Northern Pike to Muskies, there is hardly a fish on the planet that won’t take a shot at a Frigg 2.5 thats lunging, chugging, spitting and twitching across the water. Match the flavor of FISH SMACK to your target species and catch a fish. 5.5” long X 1.125” thick body. Perfect for long distance casting needs. Produces loud sounds and vibration. Cupped face churns tons of water. Slow sinking creates a ton of top-water commotion. 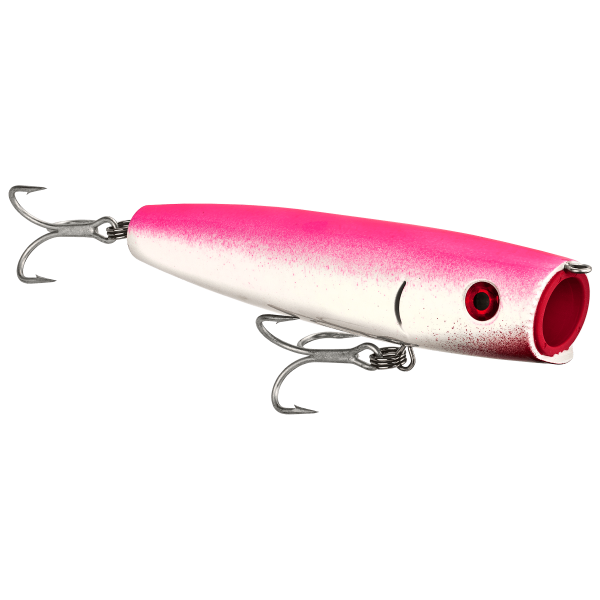 The Frigg 2.5 Kisser is designed to slowly release the Fish Smack - fish attractant.